It's never too early to begin planning for one of the biggest outdoor events in the Smokies. This year, the 22nd Annual Wilderness Wildlife Week will take place during the week of January 7-14, 2012. Considered to be the ultimate Smoky Mountain experience, Wilderness Wildlife Week is a series of activities designed to connect visitors with the great outdoors. You’ll learn from more than 100 experts who will share their knowledge of the outdoors in more than 175 seminars, lectures and hands-on workshops. You'll also have the opportunity to get closer to nature with your choice of more than 50 guided walks and hikes. Music lovers will enjoy authentic Smoky Mountain music performed live during AppalachiaFest. Wilderness Wildlife Week has been a Southeast Tourism Society “Top 20 Event in the Southeast” 10 times now. For more information, and to keep up with all the programs being planned, please click here. ** If you're going to be looking for overnight accomodations for the event, be sure to check out our list of cabin advertisers who help to support this blog and our hiking website. September 24th is National Public Lands Day, the nation’s largest hands-on volunteer effort to improve and enhance the public lands American’s enjoy. The Great Smoky Mountains National Park will be celebrating National Public Lands Day by having volunteers work with a park trail crew for a day of fun-filled trail maintenance. For more information about the workday or to sign up to participate, interested volunteers must contact the Trails & Facilities Volunteer Coordinator, Christine Hoyer at christine_hoyer@nps.gov or 828-497-1949. Below are four new hiking related books that are due to be published this week, that might be of some interest to you. Three of the books are trail guides for locations within the Southern Appalachians, while the fourth provides tips for winter backpacking and camping. From the Blue Ridge Parkway to the Great Smoky Mountains, North Carolina is renowned for its beautiful waterfalls. Hiking Waterfalls in North Carolina includes detailed hike descriptions, maps, and color photos for 140 of the most scenic waterfall hikes in the state. Hike descriptions also include history, local trivia, and GPS coordinates. The book is an ideal complement to the popular Falcon Guide Hiking North Carolina, with minimal overlapping content. Includes sixty hikes from the mountains to the ocean. The books contains maps, directions to trailheads, trail distances, trail conditions, fees, rest rooms and other facilities, nearby lodging and amenities, and where to obtain additional information. Whether you're new to backpacking in the winter months and looking to make your first experience as warm and enjoyable as possible, or a practiced winter backpacker interested in making day trips and camping trips more comfortable, this easy-to-read guide was written for you. You'll learn all about staying warm and comfortable throughout the day and night, how to fit a backpack and pack it properly, winter travel, navigation, menu planning, cooking and nutrition, how to set up camp, winter hazards, first aid, winter survival, how to ensure a fun winter backpacking experience for kids and dogs, and much more. The mountains of Georgia and South Carolina are renowned for their beautiful waterfalls. Hiking Waterfalls in Georgia and South Carolina includes detailed hike descriptions, maps, and color photos for more than 60 of the most scenic waterfall hikes in the region — many of them along the mountainous border between the two states, and within easy access of each other. Hike descriptions also include history, local trivia, and GPS coordinates. This book is an ideal complement to the popular Falcon Guides Hiking South Carolina (see above) and Hiking Georgia, with minimal overlapping content. 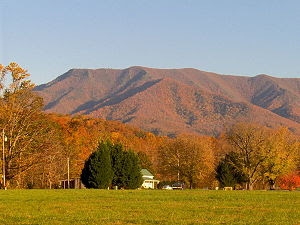 The first cold front of the year usually passes through the Smoky Mountains during the early-to-mid September time period. 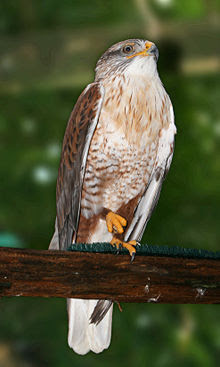 As the weather patterns change to cooler temperatures, Broad-winged hawks begin to make their annual migration down the Appalachian Mountain range to winter in the neo-tropics of Mexico, to as far south as Southern Brazil. For bird enthusiasts, this provides an excellent opportunity to watch the buteos as they kettle-up over the ridges and glide from one thermal to the next. The Broad-wings are one of the first species to begin their southern migration. Flocks or “kettles” can be quite large. You may even see a few Cooper’s, Northern Harriers and Sharp-shinned hawks joining in as well. Some of the best vantage points in the Smokies to watch the migrations are in the higher elevations of the park such as Newfound Gap, Clingmans Dome, Look Rock, or Indian Gap. Back in May I posted a blog about the Baa-tany Goat Project seeking volunteers to help oversee the goats while they consumed the vegetation that threatens to overgrow the grassy balds at Roan Mountain. The project will need help again next month when they herd the goats off the mountain before cold weather arrives. September 14th is the likely date for the operation, but if weather conditions appear favorable, they may push that date up to September 21st. If interested, please click here. So if you’re a volunteer in this operation, does that make you a goatboy or goatgirl? The Smoky Mountain Field School will be offering a program next month that will provide visitors with the chance to learn about the experimental elk release in Great Smoky Mountains National Park. Attendees will view elk and their behaviors during the mating season, hear bugling, and learn how researchers track and monitor elk in the Smokies. The course instructor will be Joe Yarkovich, a Wildlife Management/Elk Research Coordinator for the National Park Service. Joe has spent time working on wildlife projects in Sequoia National Park, Santa Catalina Island, San Clemente Island, various Louisiana Wildlife Refuges, and has played an instrumental part with the Smoky Mountains elk program as well. The program will take place in the Cataloochee Valley, and will run from 4:00 - 8:00 PM on Saturday, September 24, 2011. The cost will be $49. For more information, please click here. As the fall color season begins to wind down in early November, you’ll want to hike at the lowest elevations in the park. Check out the Miegs Mountain Trail, Schoolhouse Gap, Abrams Falls, Oconaluftee River Trail, Indian Falls, or the Deep Creek Loop. * To get periodic on-the-ground reports, visit the Fall Leaf Color page on the GSMA website. As promised, here are the answers to yesterday's Great Smoky Mountains quiz. Hope you at least got a passing grade! Outdoor retail company REI will be hosting the 2011 Radical Reels Tour in Asheville, NC on Monday, September 12, 2011, with proceeds benefitting the Appalachian Trail Conservancy (ATC). Catch the steepest and deepest in high-adrenaline outdoor sport films when the 2011 Radical Reels Tour comes to Asheville on Monday, September 12. Hurtle down steep untouched powder, feel the cold spray of stomach-dropping kayak first descents, fly high with the world’s wildest BASE jumpers, and much more in extreme mountain sports. Growing out of the famous Banff Mountain Film Festival World Tour, the Radical Reels Tour showcases nine short films that capture some of the most progressive talent in action sports including: mountain biking, skiing, whitewater kayaking and other mountain sports. Hosted by REI to benefit the ATC the Radical Reels Film Tour screens on Monday, September 12, 7 PM. Tickets are on sale now at REI only: $15, $17 starting on September 11. Event proceeds will benefit the ATC, www.appalachiantrail.org. For tickets and information please contact: REI at 828-687-0918 or cfu@rei.com. One night showing only and limited seating at Carolina Cinemas Asheville, 1640 Hendersonville Rd, doors open at 6 PM. Prizes will be given away at the screening. The Radical Reels Tour kicked off in the winter of 2004 in a limited number of special locations, and now visits about 26 states and provinces. For more information on the Radical Reels tour, including tour locations and dates: www.radicalreels.com. Some of the films include strong language that may not be appropriate for children under 14 years old. Whether you’re a professional mountaineer, a weekend warrior, or an armchair adventurer, Radical Reels will inspire and exhilarate you. Some of the films include strong language that may not be appropriate for children under 14 years old. Monday, September 12, 2011 at 7 PM. Tickets now on sale at REI Asheville. It’s been awhile since I’ve posted a quiz on the Great Smoky Mountains, so I thought I'd lay down the gauntlet to see how much you really know about the greatest national park in the country. Here are 10 questions - my toughest quiz yet - to challenge your mind today. I’ll provide the answers tomorrow. Mountain Life Festival at Oconaluftee Visitor Center with sorghum molasses making, music, crafts, and demonstrations. Earlier in the week Blue Ridge Parkway officials announced that reconstruction of the Parkway at the NC State Highway 80 access ramp and the Buck Springs Gap Overlook, located at Milepost 344, began on August 15, 2011. The project is expected to be completed by September 15, 2011. The overlook will be closed for most of this time to stage materials, equipment, and for reconstruction. The ramp will be reconstructed under one lane traffic control. Visitors wishing to hike the Woods Mountain Trail, which has access to the overlook, may park along the shoulder of NC State Highway 80. Parkway management apologizes to visitors for any inconvenience this project may cause. Excellent video on what it's like climbing Mt. Rainier in Washington state with Rainier Mountaineering, Inc. (RMI). Climbing the 14,410-foot peak was put on my radar a couple of years ago after attending a presentation by one of the RMI guides at a local gear shop. This video seems to pretty much show how a typical three-day expedition transpires - just as the RMI representative explained. The Blue Ridge Parkway is seeking public input, through September 12, 2011, on an Environmental Assessment (EA) for a trail plan for the Roanoke Valley section of the Parkway. The purpose of this EA is to describe the affected environment and analyze potential impacts associated with a no action alternative and two action alternatives. Recommendations within the EA to be implemented would impact the Roanoke Valley trail system within the lands administered by the Blue Ridge Parkway. The intent of this project is to determine whether development of an integrated trail system that would provide critical linkages between the Roanoke Valley Greenways trail network and the Parkway is appropriate after consideration of project impacts. This trail system would provide the public with a greatly enhanced range of trail opportunities as well as provide the Parkway with rehabilitation and general maintenance assistance from the Roanoke Valley Greenway Commission and associated trail groups. Comments must be sent by September 12.Ideas and concerns expressed by those who comment will be used to prepare the final proposal and impact analysis. Comments are typically treated as a public record and made available for public review. Individuals may request that the National Park Service withhold their name and address from disclosure. Such requests will be honored to the extent allowable by law. Comments will also be accepted at a Public Meeting to be held on Thursday, September 1, 2011. The public meeting will be held from 3 p.m. to 8 p.m. at Virginia’s Explore Park Visitor Center Auditorium, Milepost 115.1 on the Blue Ridge Parkway. Members of the public may stop by at any time during these hours to meet with Parkway staff and provide comments. NPS Digest is reporting this morning that on August 16th, two teenage boys on a family outing climbed over the containment wall at Erwin’s View on the Linville Falls trail. One of them slipped and went over the edge of a cliff, falling about 60 feet and ending up caught in a tree. He yelled back to his friend that he was uninjured but unable to free himself. A multi-agency rescue ensued. Due to the height and features of the cliff, the boy was short-hauled from his location by a National Guard helicopter and taken to a nearby landing zone. He was treated for minor cuts and scrapes and released. The Pisgah Center for Wildlife Education will hold an Outdoor Photography for Beginners class next Wednesday, August 24th, from 9 a.m. - 1 p.m. The program covers the basics of nature photography including how to use general equipment, as well as effective composition. Bring your own camera to this free class, which is open to ages 14 and up. The center is located 10 miles from Brevard off U.S. 276 North on Forest Service Road 475, next to the Bobby N. Setzer State Fish Hatchery. Registration is required for both classes. For more information or to register, click here, call 828-877-4423, or visit www.ncwildlife.org. Friends of Great Smoky Mountains National Park raised $201,209 through its 17th annual “Friends Across the Mountains” telethon – topping the $200,000 mark for the sixth year in a row. The total for all “Friends Across the Mountains” telethons since 1995 is now nearly $2.5 million. “We think this is the only telethon benefiting a national park. For 17 years telethon funding has protected wildlife, strengthened park environmental education programs, and improved our visitors’ experiences in so many ways,” said Dale Ditmanson, Superintendent of Great Smoky Mountains National Park. The telethon total was helped along with many generous contributions from individuals, foundations, and corporations, including $2,300 from Twin City Nissan in Alcoa. Twin City donates $100 to Friends of the Smokies from the sale of every zero-emission, 100% electric LEAF vehicle. Donations came in from Georgia, Kentucky, North Carolina, South Carolina, Tennessee- and even Texas. The event was broadcast on Knoxville’s WBIR-TV and Asheville’s WLOS-TV, and webcast, as well. Since 1993, the not-for-profit Friends of the Smokies organization has raised more than $34 million to help maintain Great Smoky Mountains National Park as a crown jewel of the national park system. Donations can always be made to Friends of the Smokies by calling (800) 845-5665 or visiting www.FriendsOfTheSmokies.org. ‘A Year of Adventure’ sweepstakes, co-sponsored by Sierra Designs and Alaska Mountain Guides, continues with the second of its once-in-a-lifetime adventure giveaways. Launched in April, the ‘A Year of Adventure’ consumer sweepstakes is offering contestants an incredible opportunity to learn mountaineering skills in Ecuador, win a trek to Everest Base Camp, or access untracked powder via helicopter in the Alaska backcountry. Premier guide service Alaska Mountain Guides will lead the trips and Sierra Designs is supplying apparel and equipment. The second installment of the contest, the Everest Base Camp sweepstakes, launches today and closes on December 17th with a prize winner randomly selected and notified the next day. The winner will spend three weeks in Nepal with the Alaska Mountain Guides, trekking through the Himalayan Mountains to spend a night above 17,000 feet at the foot of the world’s tallest peak. Sierra Designs prize pack will include SD Convert 3 tent, Revival 50 packs, Mantra Fusion jackets, and Fusion Pants. The winner of the third and final sweepstakes will float through untracked powder on seldom-skied peaks in the Alaskan backcountry. The Heli Skiing in Alaska sweeps will start on December 18th. Contestants will be able to enter until midnight on April 17, 2012 with a winner drawn the following day. The Heli Skiing prize pack will include Sierra Designs Ministry 40 packs, Gnar down jackets, Mantra Fusion jackets, and Fusion pants. For more information on the sweepstakes and how to enter, please click here. Enter once for a chance to win any of these three trips. Each prizewinner will have up to one year to schedule their trip. Next month the Smoky Mountain Field School will be offering a program where visitors can learn about the successes and failures of several wildlife restoration programs in the Smokies. You'll have the opportunity to learn about the challenges of wildlife restorations, the current status of the programs today, and what's next for wildlife reintroduction in the Smokies? You'll also learn the specifics about the Smokies elk program, including radio telemetry tracking techniques to pinpoint locations or determine if the animal is alive, how elk biologists capture newborn calves, and the specifics on how elk have been managed since their release in 2000. The program runs from Noon - 8:00 PM on Saturday, September 10, 2011, and will be instructed by former Smokies wildlife biologist, Kim DeLozier. For more information, please click here. Next month is the annual Fall Roan Mountain Naturalists' Rally. For 49 years the Naturalists' Rally has drawn nature enthusiasts to Roan Mountain on the weekend after Labor Day. This falls' rally continues to celebrate the natural world by providing two top speakers, well-known birder and author, Fred Alsop, and site geologist for the Gray Fossil site, Mick Whitelaw. In addition to buffet dinners and evening programs, the Rally includes several guided field trips and hikes over the course of the weekend event. The Rally is scheduled for September 9th through 11th, 2011. For more information, including registration, please click here. "I woke up one day and found myself in a 35-year-old body. Gone were the lithe, spring-loaded legs of my youth. It was time to face a hard truth: I would never be as fast as I once was." A couple of weeks ago I posted a video about David Worth's record breaking run across the Smokies. Worth, a Great Smoky Mountains interpretive ranger, trekked 72 miles from Fontana Dam to Davenport Gap in just 14 hours and 50 minutes, beating the previous record by 55 minutes. That previous record was set by Will Harlan. In the current issue of Blue Ridge Outdoors Magazine is an article about Will's record setting run across the Appalachian Trail in the Smokies, written by Mr. Harlan himself. It's really a great read. Next Saturday the Smoky Mountain Field School will be hosting two retired park rangers, Joe Kelley and Dwight McCarter, as they review their book Meigs Line, which discusses a survey line established in 1802 through what is now the Great Smoky Mountains National Park, and was, at that time, the boundary between the United States and the Cherokee Nation. Over a period of 40 years, the two authors actually travelled this boundary, and found existing tree blazes and monumentation points. They'll share stories and special events that occurred while they worked in the Great Smokies during the 1960s, 70s, and 80s. Hear selected readings and some favorite passages from the book. There will be time allowed for questions and discussion. The presentation will take place from 9:00 AM - 3:00 PM next Saturday, August 20, at the Pigeon Forge Library. For more information, please click here. For anyone considering a trip to see the beautiful fall colors of the Great Smoky Mountains, now is the time to make your plans and have your reservations in place. October in the Smokies is the second most popular month in terms of park visitation. And with the awesome beauty the autumn season provides, it's really no wonder. If you do plan to visit the Smokies this fall, please take a moment to check out our Cabin and Chalet Listings for Gatlinburg, Townsend, Pigeon Forge and the North Carolina side of the Smokies. By supporting our sponsors, you help to keep this blog and the HikingintheSmokys.com website up and running. Great Smoky Mountains National Park Superintendent Dale Ditmanson is inviting the public to two open houses to discuss changes the park is considering in the way it manages its backcountry campsite reservation system. The open houses are set for Tuesday, August 16 at the Old Oconaluftee Visitor Center at 1194 Newfound Gap Road in Cherokee, NC and on Thursday, August 18 at Park Headquarters at 107 Park Headquarters Road in Gatlinburg. Both events will run from 5:30 to 7:30 p.m.
Professional and amateur photographers are officially invited to participate in this year’s Appalachian Mountain Photography Competition! Every year the competition gets more fierce as photographers from all over the world submit hundreds of entries for review. What will you be submitting this year? There are a couple of new developments for this year’s competition that you should be aware of. The prize for the Our Ecological Footprint category is larger than ever, totalling $450. Appalachian Voices will be furnishing $200 cash while Mast General Store will be contributing a prize package worth $250. That makes this category the 3rd largest prize! If you need inspiration on capturing imagery that shows negative impacts on the environment in Southern Appalachia please visit the Appalachian Voices website for the latest news. The Blue Ridge Parkway Foundation’s category, Blue Ridge Parkway — A Ribbon of Road, will focus on images of the Blue Ridge Parkway that incorporate some aspect of the roadway itself. Please note that this year’s timeframe for submissions is a bit different as well. The deadline for submissions for his year’s contest is November 18, 2011. You may recall the guest blog series from several weeks ago by a friend of mine that chronicled his l’Etape du Tour ride in France. Just a couple of days ago he sent me a link to a photo montage that provides a much more in-depth look at his ride, that replicated Stage 19 of the Tour de France this year. At 26 minutes, the photo show might be a little lengthy for some, but the photographs of the French mountains are beautiful. Additionally, they provide a general idea of what its like to climb some of the most famous mountains in the worlds greatest bike race. This Thursday, August 11th, is the 17th annual Friends Across the Mountains Telethon. The telethon will be broadcast on WBIR-TV Channel 10 in Knoxville, TN and WLOS-TV Channel 13 in Asheville, NC from 7:00 PM - 8:00 PM. The broadcast highlights projects and programs that Friends of the Smokies has funded. The telethon raises roughly $200,000 each year. It's a fun event that raises awareness of both the Park's needs (as the only major national park without an entrance fee) and the ways that Friends of the Smokies helps to fulfill some of those needs every year. You can also make a donation right now by clicking here. The final Full Moon Hike of the summer will occur next week in Cades Cove. 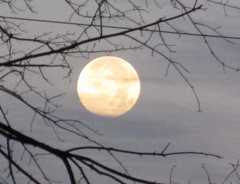 This is a great chance to take an easy ranger-guided stroll in the Smokies under a full moon. The hike will be from 8-10 p.m. on Sunday, August 14th. If interested, meet at the Orientation Shelter near the entrance to the Cades Cove Loop Road. Don't forget to wear comfortable walking shoes. Discover Life in America will be hosting its annual Biodiversity Hike to the Mt. LeConte Lodge over the weekend of September 3rd and 4th. The hike will be guided by an expert naturalist, and will include a picnic lunch on the Alum Cave Trail, as well as dinner and breakfast at the LeConte Lodge. DLIA executive director Todd Witcher will be giving a presentation on the All Taxa Biodiversity Inventory project, and park service staff will hold a sunset program at Cliff Tops. The mission of DLIA is the All Taxa Biodiversity Inventory (ATBI), a joint effort with the National Park Service, that aims to identify and record every single species within the Great Smoky Mountains National Park. To date, the ATBI has discovered 910 species that are new to science, and 7101 species that are new to the Smokies. Click here for a summary of these discoveries. The cost for the Biodiversity Hike is $275 per person, which includes meals, lodging, as well as support for DLIA . To reserve one of the limited spaces, call Todd Witcher at 865-430-4756, or email him at todd@dlia.org or click here. Each year Rangers are involved in hundreds of search and rescue operations in the Smokies and other National Parks. Almost all of these incidents result from accidents and circumstances that are avoidable, and most involve accidents and situations that are repeated over and over. Next week the Smoky Mountain Field School will be offering a combination of lecture and hands-on exercises where you'll have the opportunity to learn the common denominator factors in most backcountry incidents, and how to prevent accidents and protect yourself while in the backcountry. You'll also learn how to be properly prepared with equipment, clothing, food, water, what to be aware of, what to avoid, safety around wildlife, and backcountry hazards. The course will also discuss and demonstrate wilderness survival techniques to use in an emergency, and provide an introduction to legally and safely foraging for wild natural food in the National Park in order to survive a backcountry emergency. The course will be from 9:00 AM - 4:00 PM next Saturday, August 13, 2011. For more information, please click here. 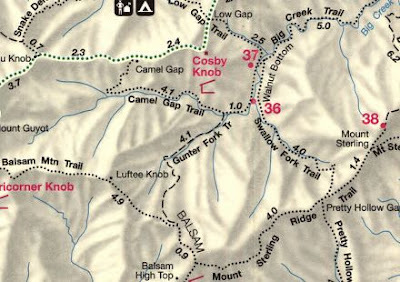 Managers at Great Smoky Mountains National Park have announced that the Gunter Fork Trail between the Camel Gap Trail and the Balsam Mountain Trail is closed until further notice due to three landslides. The slides occurred during a heavy rain event on or about July 15. The 4.1 mile Gunter Fork Trail lies in the east end of the National Park in Haywood County, NC. The Gunter Fork Trail is one route that takes users from the Walnut Bottoms area up to Balsam Mountain and Mt. Sterling, but is not one of the Park’s most heavily travelled trails. The Swallow Fork Trail provides alternative access to the same areas. Managers have no estimate of when the Gunter Fork Trail may reopen. All or parts of five other Park trails west of Cades Cove in Blount County, TN are still closed for repairs. The trails: Rabbit Creek, Hatcher Mountain, Cooper Road, Beard Cane and Wet Bottom were heavily damaged by an F4 tornado on April 27. For the latest advice on hiking in the Smokies visitors are invited to stop at the park’s three visitor centers. Hiking information is also available by phone at (865) 436-1297. During one of the major snow events of 2010, Jonathan Ibach, Morgan Harris, Justin Russell and Wes Overvold climbed over snow-covered fallen trees and trudged through 4-foot snow drifts to the summit of 6285-foot Roan Mountain. Roan Highlands Winter from Wesley Overvold on Vimeo. Next Saturday is the final part in the Survival Skills Workshop at Chimney Rock State Park. In this workshop participants will learn “Basic Wilderness First Aid”, including how to treat victims of hypothermia or heat exhaustion, among other subjects. The workshop will be lead by naturalist Clint Calhoun. The date for the workshop is August 13th from 9am - noon. Cost: $25 for Adults, $20 for Annual Passholders individually (includes Park admission for the day). The Appalachian Trail Conservancy’s (ATC) Rocky Top Trail Crew is searching for horse packers and crew volunteers this Fall to help maintain the Appalachian Trail (A.T.) in the Great Smoky Mountains National Park. The ATC will provide food, tools, equipment and professional Trail Crew leaders to aide volunteers. The Rocky Top Crew, celebrating its 15th anniversary this year, works exclusively on the 35 miles of the A.T. through the Great Smoky Mountains National Park that is open to horse use. Beginning on September 5, 2011, volunteers can participate in one of the six packing days or one of five week long sessions. Crew members arrive on the afternoon before their work session for dinner and orientation. Crew members working more than one session may stay at the base camp during their days off. Horses take supplies to volunteers on six separate packing days. Any equestrians who hike the Trail are welcomed to bring their horses along and help the Crew maintain the A.T. in the Park. The experiences of working together, learning new skills, and backcountry living makes for an unbeatable combination of fun. No experience is necessary, but you must be 18 years or older to participate. This unique partnership between hikers and trail riders keeps this section of Trail open and in good shape. Join our partnership today and protect the A.T.
For more information or to register, visit www.appalachiantrail.org/crews or contact Andrew Downs at (828) 254-3708. REI (Recreational Equipment, Inc.), a national outdoor gear and clothing retailer, announced plans yesterday to grant $4.2 million this year to nonprofits across the country that work to preserve and maintain natural spaces through active volunteer programs. The company designates three percent of the previous year's operating profit to its annual grants program. Because REI employees have the most direct connection to local nonprofits, store employees nominate organizations from their local community. REI invites selected nominees to apply for grant funding. Eligible organizations must be outdoor nonprofits that promote active volunteerism through their programs, such as hands-on trail building or restoration events. 2011 applications were submitted throughout the spring and REI is currently notifying grant recipients in each of its communities. In the coming months, members and customers can visit their local REI store, the REI Blog or their local REI Facebook or Twitter page to learn more about REI’s selected grant partners and how to get involved. Last year, the company granted $3.7 million to more than 320 nonprofits across the country. A full list of the REI’s 2010 grant recipients is available at REI.com. Throughout the year, REI stores extend their partnerships with outdoor nonprofits by promoting community events, raising visibility with REI customers and, in some cases, providing gear loans and offering product donations. Organizations looking for additional information on how to partner with REI can contact their local REI store. Additional information about REI’s giving philosophy and corporate social responsibility efforts is also available at www.rei.com/stewardship. At about 3:30 p.m. on July 30, Great Smoky Mountains National Park Dispatch received a report that a young woman had been swept over the 15-foot high waterfall at the Sinks on the Little River about 10 miles west of Gatlinburg, TN. Witnesses reported that the woman had been wading across the river in knee-deep water just above the falls, when she lost her footing and was swept over the falls. At the base of the falls she became entrapped in a crevice that held her underwater in chest-deep water by the force of the water coming down from above. Visitors formed a human chain and attempted to pull her free, but were unable to overcome the force of the water. Rescue workers were able to free her body at about 6:15 p.m. using a rope and pulley system. Great Smoky Mountains National Park Rangers coordinated the response. The recovery was carried out by responders from Blount County Sheriff’s Office, Townsend Volunteer Fire Department, Blount County Fire Department and Rural metro Ambulance. The identity of the victim was withheld until Sunday morning July 31 to ensure notification of kin. The victim was 17year-old Amber Rose Mirisola of Mt. Dora, FL. Park officials say that the there are numerous signs posted at the Sinks advising visitors of strong currents and hidden hazards and advising caution in and around the water. This is the second drowning in a month at the Park which has been experiencing near-record warm temperatures all summer, prompting many visitors to recreate in the water. * A 26-year-old hiker was descending from the summit of Half Dome in Yosemite National Park last Sunday when she fell 600 feet to her death from the Half Dome cables. A severe lightning, thunder, and rainstorm was present in the area for several hours that morning and afternoon, which likely made the granite slopes of Half Dome slick. * A 23-year-old climber fell 50 feet on the evening of July 27th in the Chickamauga & Chattanooga National Military Park. Responding park and local rescuers treated his injuries and began a carryout up to the rim of Sunset Rock in the park’s Lookout Mountain area. He was air-lifted that evening with non-life-threatening injuries – a dislocated shoulder and a shattered left foot. * Rangers in Grand Teton National Park rescued a 20-year-old hiker who fell 1,200 feet last Friday morning and sustained critical injuries. Ryan Haymaker of Houston, Texas, was glissading down the Ellingwood Couloir on the south side of the Middle Teton when he lost control and hit a rock, causing him to flip over and continue head first down the couloir. A bystander who witnessed the fall called 911 to report the incident. Haymaker was loaded into a helicopter and flown to the Lupine Meadows rescue cache, where he was met by a team of emergency medical providers. Haymaker was stabilized at the rescue cache and then flown directly on an Air Idaho life flight to Idaho Falls. Haymaker and his companion had glissaded about a third of the way down the couloir when the incident occurred. Haymaker was glissading behind his companion when he picked up speed and passed him; shortly thereafter, he hit the first series of rocks. Haymaker was not wearing a helmet at the time of the incident. Although he was carrying an ice axe and wearing crampons, he was unable to right himself or self arrest. * On Sunday, July 24th, Mt. Rainier National Park dispatch received an emergency PLB (personal locator beacon) signal from a party climbing high on the Kautz Glacier route on Mt. Rainier. After determining the location of the signal, climbing rangers from Camp Muir responded on foot to find a visitor with a probable fractured tibia/fibula. The climber was injured after hitting a rock while “glissading” down a steep snow slope. A team of ten rescuers worked throughout the night to evacuate the injured climber across three miles of steep and glaciated terrain. The rescue required complex rigging techniques to complete nearly 2000 feet of roped lowering. After reaching the lower Nisqually Glacier, the team was met by seven additional rangers from Paradise who assisted with a technical hauling system and the remainder of the evacuation to the trailhead. * A 15-year-old Boy Scout was killed in a boating accident on Lake Powell in Glen Canyon last Thursday night, and a second Boy Scout and an adult were injured. A group of scouts and adults were riding in a boat back to camp after dinner on Antelope Island. The boat, which was being operated in darkness, apparently struck a rock outcropping, throwing the boy out of the boat and fatally injuring him. The second Scout and the adult sustained injuries in the impact but were not thrown from the vessel. The Scout was flown out by Classic Lifeguard helicopter for medical attention. The adult was transported by ambulance to Page Hospital. * Several drownings have occurred in the last several days, including one at the Sinks in the Great Smoky Mountains, one in the Curecanti National Recreation Area, as well as two separate incidents on the Upper Delaware Scenic & Recreation River.